When it comes to foundation repair, you have to worry about more than what’s underneath your building. 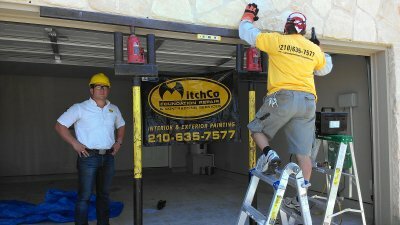 When the lintels above your garage doors start to fall apart, you may find yourself dealing with cosmetic issues as well as safety concerns.Our San Antonio foundation repair team offers complete lintel repairs. If you have lintels supporting bricks, stone, or other material that are buckling or cracking, it can pose a serious safety issue. These minor problems can start to sag, and eventually collapse as the veneer integrity fails. With our residential or commercial services, you can get a damaged lintel repaired immediately, restoring the strength of this support system and contributing to the improved appearance of your home. If you’re not sure if your lintels need restoration or simple repairs, we’d be happy to take a look and help you decide how to proceed. If you’re not familiar with foundations, concrete, or construction in general, you might not know what a lintel is. Although a capable concrete contractor should be able to tell what you mean, it helps to know exactly what kind of services you’re looking for. Lintels are supports for various materials, and you can probably find them all over your property. You should deal with broken lintels as soon as you can, because they can pose a serious threat to the safety of your family. Garage – Since your garage door is likely the heaviest moving component of your home, damaged lintels above can be particularly dangerous. We will quickly and efficiently repair the lintels above your garage door to minimize your risk of injury or damage. Door – As is the case with garage doors, you can find lintels above the other doors to your home. It might be even more important to keep these lintels intact, as you might use your front or back door more frequently than your garage door. Damaged lintels above your front door can also take away from the appearance of your home, so be sure to talk to the MitchCo team to have them taken care of. Window – There are a few different types of dangers associated with windows. They’re especially important to stay on top of if you have children in your house. Faulty lintels that support brick or stone are especially hazardous, so don’t waste any time in calling MitchCo Foundation Repair to have them repaired or replaced. We can assess the damages and make expert recommendations on the best repair options utilizing our experienced and skilled repair team. Payments plans may be available with no interest, no finance charges, and no credit check! Call us today at (210) 635-7577 for the assistance you need with as little as $350 down!